"Use your supernatural knowledge to devise a scheme whereby we capture Troy. I will give you two days. Two days to think of something really ingenious." 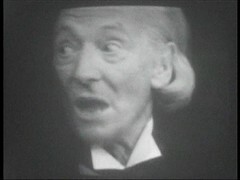 Taken to the Tardis landing side the Doctor confesses not to be Zeus but bargains with the Greeks for their lives: The Greeks agree on the condition that the Doctor comes up with a way to attack Troy in two days. Hector's brother Paris takes the Tardis back to Troy where his Father Priam views it and his sister Cassandra, a prophetess, who wishes to burn it as an offering to their gods because she's had a dream of something being brought into the city containing Greeks who will escape and slaughter them all. Vicki emerges and is taken under the protection of Priam who wants her knowledge of the future but is denounced by Cassandra who fears a rival prophet. 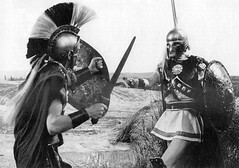 Steven, posing as the Greek Diomedes, battles with Paris and is taken into Troy where he is reunited with Vicki. Cassandra believes they are both spies and orders soldiers to kill them. STEVEN: Why not the wooden horse? DOCTOR: Oh, my dear boy, I couldn't possibly suggest that. The whole story is obviously absurd. Probably invented by Homer as some good dramatic device. No, I think it would be completely impractical. STEVEN: Yes, well, if you say so, Doctor. But in that case, hurry up and think of something else. The only way we can rescue Vicki is to get into Troy. We've only got two days left. DOCTOR: I sincerely hope not. Have you thought of tunnelling? ODYSSEUS: It's been done. What we want is something revolutionary. DOCTOR: Ah, yes. Dear me, sear me. Well, tell me, have you thought about flying machines? ODYSSEUS: No, I can't say I have. Oddly Helen, the cause of this, is absent from the action in this serial! The comedy element is emphasised by the actor playing Paris, Barrie Ingham, sounding exactly like John Le Mesurier at times! 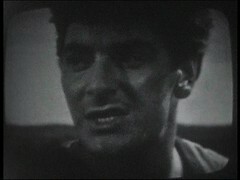 Ingham had previously appeared in the Dr. Who and the Daleks feature film as Alydon. He's had a long career on both sides of the Atlantic. Things that spring out to me include Det. Chief Supt. Canning in the final episode of The Sweeney, an officer who implicates Jack Regan in a corruption scandal leading to his resignation. He's in my favourite episode of Airwolf, Fallen Angel, as Vladimir Kinskov and he isn't the only actor from Doctor Who to appear in it: John Brandon, The American Sergeant who becomes the Cybermen's first victim in the Tenth Planet, plays Zeus, Archangel's boss, in the same episode. He's been in Randall and Hopkirk %28Deceased%29, Street Hawk, The A-Team, Hill Street Blues and Dynasty %28TV series%29. He's even part of a select group of actors who've been in both Doctor Who and Star Trek courtesy of his Star Trek: The Next Generation in Up the Long Ladder. Toby Hadoke interviewed him for his Who's Round podcast in episode 16 which you can listen to here. He died in early 2015. On our right is King Priam, played by Max Adrian who, despite a long career, is probably best known for playing Senator Ludicrus Sextus in Up Pompeii! His daughter, the priestess & prophetess Cassandra is played by Frances White. 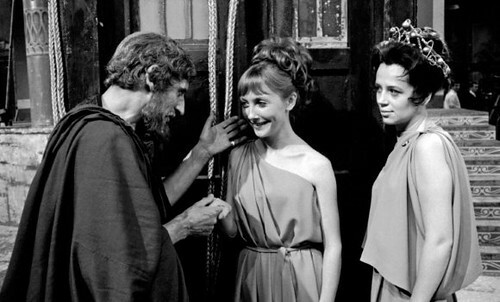 She has a more serious Roman television production on her CV having appeared in I, Claudius as Julia the Elder. The chances are you've heard her on television and not realised it: she's the voice of Peppa Pig's Grandma. Peppa's Grandfather is another Doctor Who actor: regular Dalek voice artist David Graham. For many years no photo known of Cassandra was thought to exist. Then the above picture came to light. 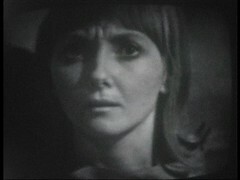 The left hand side had been seen many times, notably in Doctor Who monthly's archive on the series but the right, including Cassandra, was always missing. If you look carefully you can see why: two members of the crew are visible in the background! There's lots of extras employed for this episode sadly with little indication of what they played on IMDB. 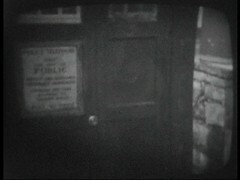 I presume most of them are in the crowd scenes as the Tardis is brought into the city. Two of them though later return to the program in credited roles: John Joyce is Garvin, the Verger, in first two episodes of The Dæmons while Michael Osborne portrays Sorak in The Horns of Nimon. 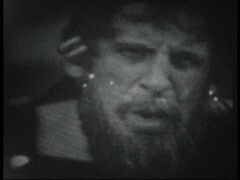 He also returns in The Ark playing an uncredited Guardian in episodes 3 & 4 The Return & The Bomb. Oddly several of this episodes extras are in the same tale: Eric Blackburn later becomes a Monoid while David Greneau is the Defendant in the first episode The Steel Sky. 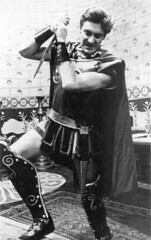 Walter Henry is later in Doctor Who and the Silurians, Inferno and The Masque of Mandragora while Darroll Richards is a Parisian Man in The Massacre 1: War of God (1966) and John Moore, here a Trojan Man, returns in Frontier in Space. 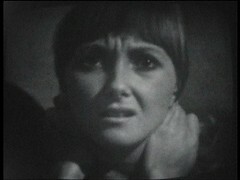 Doreen Ubels, a Trojan Woman, had already been in An Unearthly Child episode 2: The Cave of Skulls as a Tribeswoman and returns in The War Machines: Episode 4 as Fleeing Woman while the first episode of the same story features Jack Rowlands as an Interviewer and the next, The Smugglers, has Ricky Lansing, Trojan Guard, as a Villager at Inn & Pirate. Another Trojan Woman, Cara Stevens, is a Technician in the first two episodes of Doctor Who and the Silurians and, like Trojan Guard James Duggan had appeared in episodes of the famed Quatermass and the Pit. She's in the The wild Hunt, he's in The Enchanted and they're both in Hob. I couldn't work out who it was in this second shot: again m'learned colleagues at Roobarb's DVD forum came to my aid to point out that it's King Priam, one of the few non series regulars to appear in these off-screen shots. 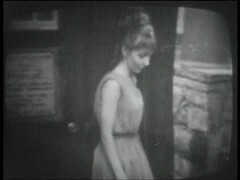 After seeing Doctor & Steven on the plain we're treated to a shot of Vicki leaving the Tardis. When we watched/listened to the Crusade, when I watched and listened to all the episodes in the correct order for the first time, I said I had a story relating to the Myth Makers and experiencing things in the right order. Well a few months ago, before I started blogging, I made an effort to listen to all the Doctor Who stories I'd not previously heard. The Myth Makers was the first so one day, when travelling from Swindon to my Mum's in Kingston I decided to listen to it using my new MP3 player. I put it on on Swindon station and struggled to follow the action, which I put down to it being a historical story which I don't particularly enjoy. By Reading, where I changed trains, I was on episode 2. As episode 3 came round I heard something described as having happened. "Hmmm", I thought, "didn't hear that". Then the event described unfolded as I listened. "This is odd I thought". I then realised that my new MP3 player, despite me thinking I'd set it otherwise, was playing the tracks within the episode in a random order! 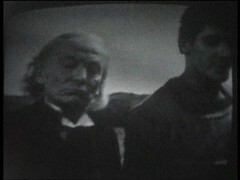 And finally: Small Prophet, Quick Return is the only Doctor Who title, for a story or an episode, with a comma in it!